Hug his belly and he will gently snore you to sleep..
Time to snuggle up with the sweetest bear yet! 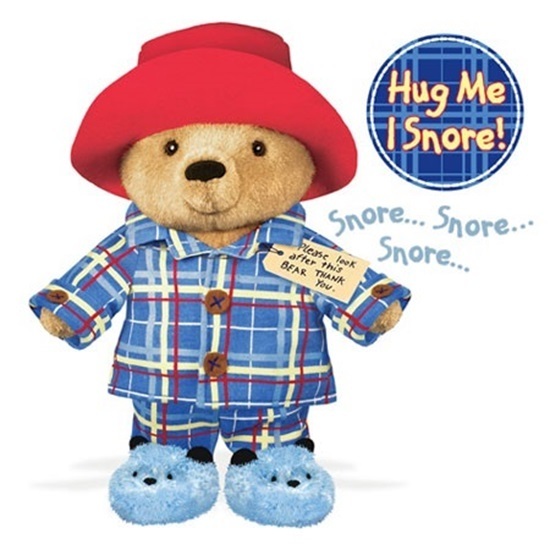 “PJ Time Paddington” is ready to snuggle and at 10-inches tall, he is perfect for doing just that! This is a soft honey brown plush bear with black sparkling eyes, a black flocked nose, and a hand embroidered smile. He is dressed in removable soft custom printed pajamas with hand stitched felt buttons, and complete with light blue fluffy bear slippers. His signature red felt hat sits atop his head,and his tag that reads “Please look after this bear. Thank you” is attached to his neck. Gently squeeze his tummy, and you will hear him snore!